5 PM Update: The Washington temperature has hit at least 105°F (40.6°C) as of 5 pm, within 1°F of the all-time high temperature record. This is also the earliest 105°F; the previous record was July 10, 1936. The record high temperature of 104° so far today breaks the record of 102° set just 2 years ago and marks the third consecutive day with 100°+ temperatures in Washington. 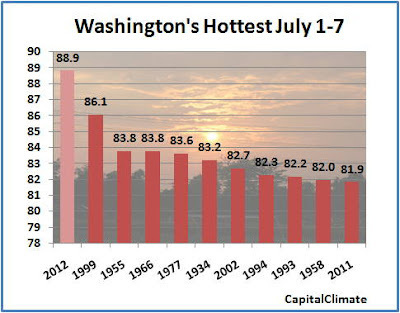 Along with the morning low of 82°, this virtually guarantees that the current week will close out as the hottest July 1-7 in Washington weather records. Since data collection began at or near the current National Airport location in 1929, the previous hottest first week of July was in 1999, when the average was 86.1°. Assuming no further change in today's readings, the 7-day average will be 88.9°. This is 7° above the pace of last year's all-time hottest month. In order to avoid breaking the weekly record, today's low would have to drop to at least 46°. "Areas with record and near-record dryness too numerous to mention"
The latest U.S. Drought Monitor report, issued yesterday for data through July 3, shows that the total area of the 48 contiguous states in some level of drought (over 76%) is the largest since at least 2000. 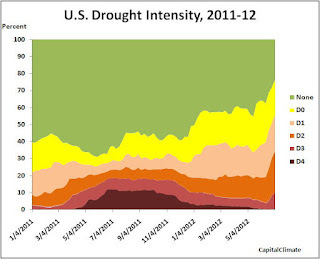 While Tropical Storm Debby virtually wiped out drought in Florida, much of the Southeast remains in drought, with over one-third of Georgia in Extreme or Exceptional drought (D3-D4). 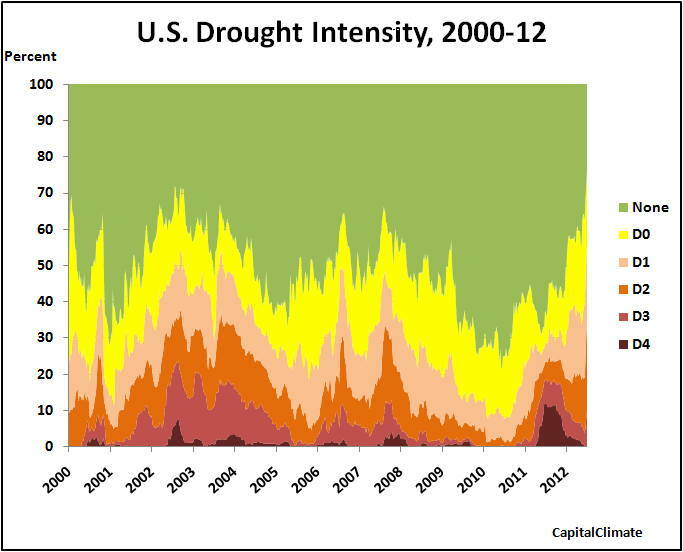 Other than Florida, the least droughty areas are generally in the corners: the Pacific Northwest, northern Great Lakes, and Northeast from Pennsylvania through New England. Overall, this week featured the expansion and intensification of dryness in large sections of the country, with only southern Texas reporting some improvement. 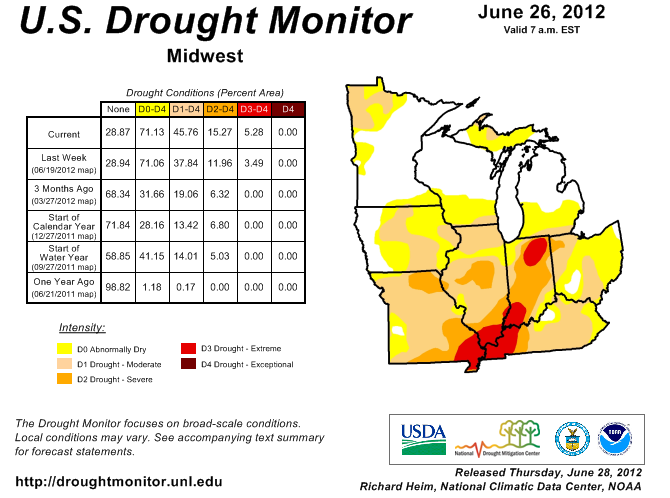 Light precipitation (0.5 inch or less) fell on most areas of dryness and drought, with only scattered areas reporting more than an inch, primarily in the northern Plains, lower Mississippi Valley, southernmost Great Lakes region, Appalachians, mid-Atlantic region, and southern Texas. This despite a couple of thunderstorm complexes that pushed rapidly from northern Illinois east-southeastward through the mid-Atlantic, including one on June 29 that caused significant damage, knocked out power for millions of customers, and took 2 dozen lives. Unfortunately, where rain did fall (outside southern Texas), it was not enough to make up for blistering heat that covered the Nation’s midsection, reaching the central and southern Atlantic Coast by the end of the workweek. Both the number of record highs in the past week, and the areas with record and near-record dryness over the last 1 to 3 months, are too numerous to mention. 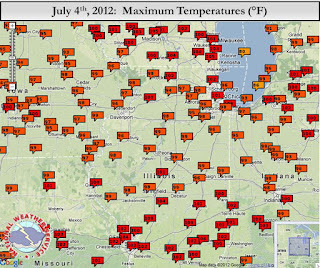 Daily high temperatures averaged above 100 degrees in the central and upper southern Plains, extending eastward into parts of Missouri and Arkansas, and average temperatures for the week were 8 to locally 15 degrees above normal from the Ohio Valley and upper Southeast westward through most of the High Plains. 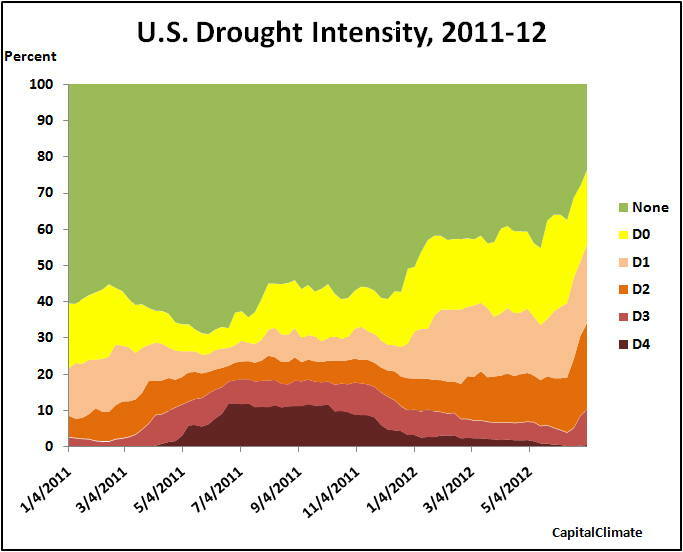 The dryness is beginning to take a significant toll on some of the Nation’s crops, pastures, and rangelands. In the primary growing states for corn and soybeans (18 each), 22 percent of the crop is in poor or very poor condition, as are 43 percent of the Nation’s pastures and rangelands and 24 percent of the sorghum crop. In addition, the area scorched by wildfires expanded significantly. 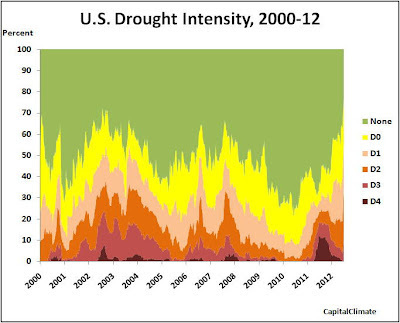 Over 1.9 million acres have been engulfed since the start of the year, and increase of 38 percent in just the past week. 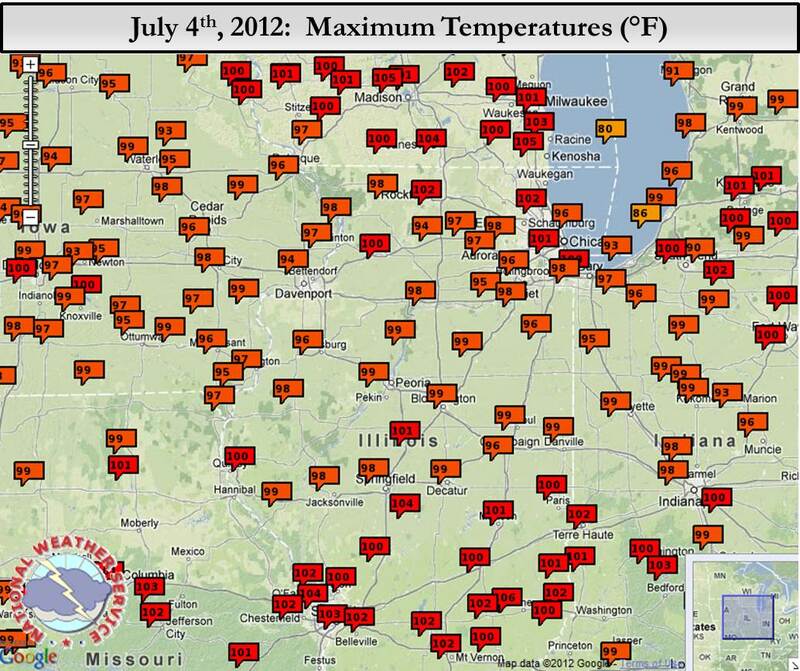 The continuing heat wave at Chicago has crushed the daily high temperature record for July 6 by at least 4°. The high so far today of 103° also marks the third consecutive day of 100°+ temperatures, tying the record set in 1911 and 1947. 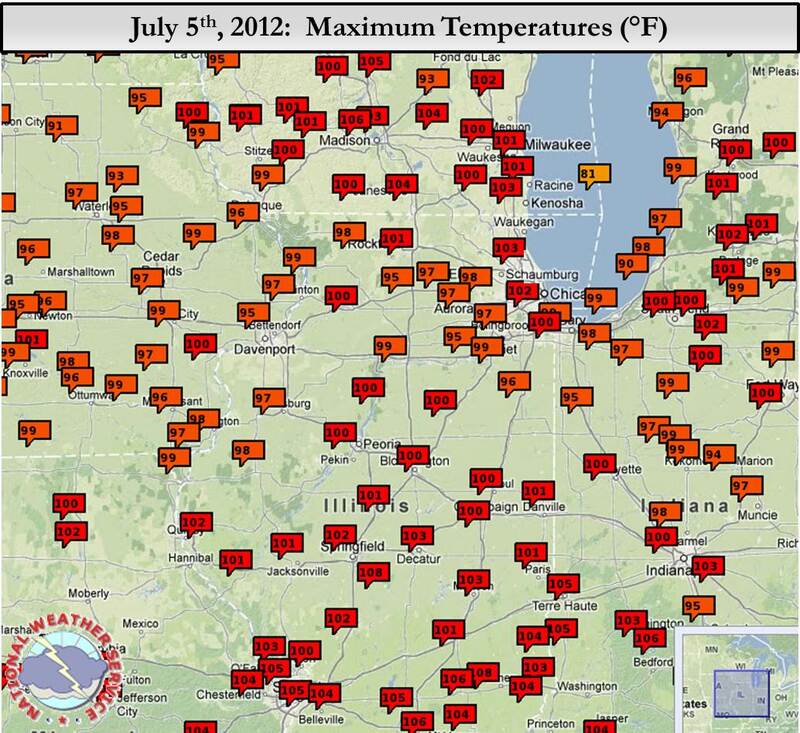 The all-time record hottest temperature at Chicago was 105° on July 24, 1934. 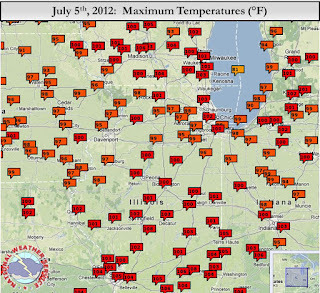 DEGREES...WFO ROMEOVILLE 100 DEGREES...AND WAUKEGAN AT 100 DEGREES. The inimitable Great Santelli on CNBC this morning interviewed a commodities trader who also farms corn in southwestern Michigan. He said, "Right now we're at a drought situation at my farm. we're looking at five and a half weeks without water. The corn is waist high, getting ready to tassel. We need water." 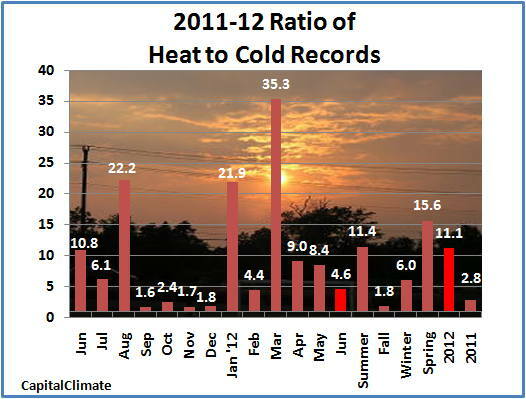 Although it began on a relatively mild note, June 2012 ended with a rush of high temperature records, including many monthly records and even some all-time records. The nearly 2300 new daily heat records were about 50% more numerous than in May, although the ratio to cold records declined to 4.6 to 1. This was the lowest since February's 4.4 to 1. For the year to date, the ratio is now over 11 to 1. Heat records have outnumbered cold records for 18 consecutive months since December 2010. Based on unadjusted National Weather Service data, the average temperature for the 48 contiguous states in the week ending June 30 was 73.4°F, which is 1.7°F above average. Temperatures were above average in every region except the Southeast, Northwest, and West. This marks the 29th consecutive week, dating back to early December, with warmer than average U.S. temperatures. 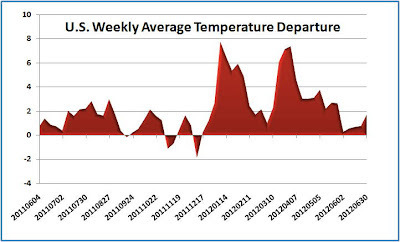 For the month as a whole, the average was 70.2°F, or 1°F above normal. Following a report on the extreme heat and damage caused by intense storms in the Mid Atlantic region and the wildfires in Colorado, the PBS NewsHour tonight had an interview with NCAR climate scientist Kevin Trenberth, in which he said, "And now we're going outside of the realm of conditions previously experienced."